This is a “vintage” Simply Kierste project from several years ago. We’ve moved several times since these pictures were taken, but I still have the garland bunting and LOVE it. It’s proved to be staple in my fall decor, so I dug this post out of my archives to re-share! Burlap is one of my favorite things to work with, and it’s absolutely perfect for this time of year. This darling and Simple Burlap Garland Bunting is one of those simple touches, and will take just minutes to make! It’s also an inexpensive project–less than $5–plus all you need is some burlap and some twine! 1. Measure your space, and cut a piece of twine to fit the space, plus a little extra on either side. Tie a knot where you want to begin your strips of burlap on one end, and a knot on the other end, where you want your strips to stop. 2. Cut the burlap into strips–I wanted mine long, so made them about 2 inches wide and 18 inches long. 3. Starting where the knot is, start tying your strips of burlap on the twine. I used about a yard of burlap. Add this to your mantel, a doorway, or even across your front porch for a darling addition to your fall decor. 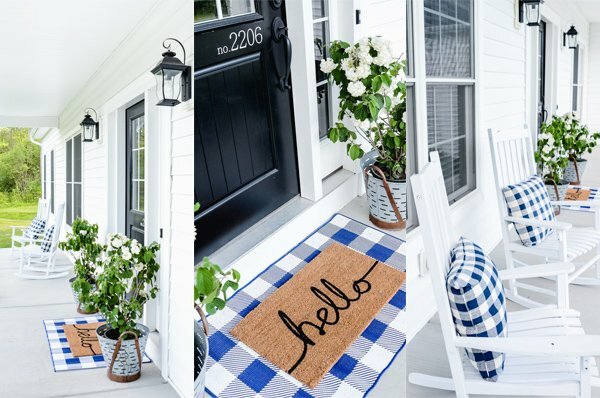 This is such a simple project, and I love that it can add so much charm to a doorway, window, mantel, entryway, or anywhere you like it! It’s super versatile, and work across several seasons, which makes it even better. It’s also extremely cost effective, so if you’re looking for inexpensive ways to add to your fall decor, look no farther! Random question: what is the paint color on your wall? I love it. Wow. So easy yet looks so great! Love it for fall! Headed to Hob Lob today for my burlap! perfect for the season! And what a gorgeous mantle you've set up, i love it! Coordination Queen–It's Dry Dock, by Sherwin Williams! Oh my gosh I love the simplicity of this. Burlap and I do not get along but this I think I can handle! There is beauty in simplicity! Love the simplicity of it; love the look; and love the cost! Great idea…thanks! Very, very cute, and SIMPLE ; ) Thanks. Love this!! Wondering about the family sign too….super cute ideas. I love reading your blog! This is simply so cute! Love it! Gorgeous idea! And also LOVE the family sign! Can you tell where you got it? Thanks!